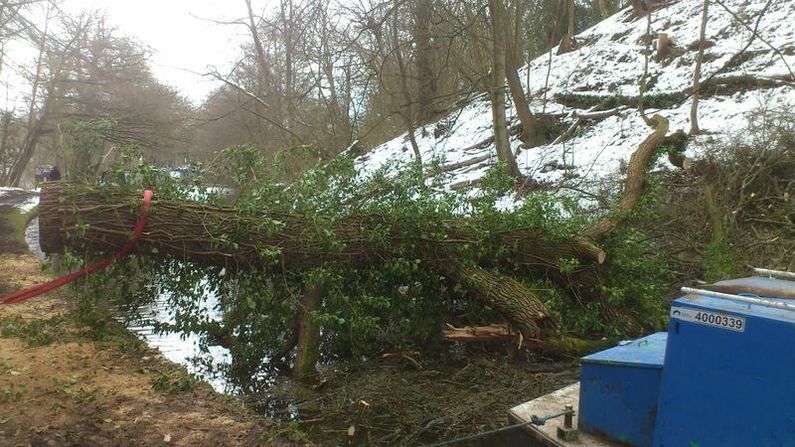 Trees that have fallen into or are over/next to water sources require specially trained operators with not only the relevant industry qualifications (NPTC/LANTRA) to carry out the tree work but also specialist training and safety equipment (PPE) to work in or close to water. We have specialists who are qualified to Swiftwater Rescue Technican (DEFRA Module 3) and Drysuits, PFD's (Buoyancy Aid's), Throwlines and releasable sytems that are best practice when working in and around water. Full Method statements and risk assesments will be provided to clients before work is carried out. We also can provide a floating work platform that can be tethered close to the work site to allow operators to be in the best position to carry out the work.